TULARE COUNTY – This November’s election will, for the first time, ask Californians to put their money where their mouth is. After decades of watching food appear at the grocery store, in restaurants and at mini marts, voters statewide will finally have to weigh the price tag of growing food and the price of poverty for those who pick it. On Nov. 6, California voters will have to think about where the majority of their food comes from when they decide to vote yes or no on Proposition 3. Titled the Water Supply and Water Quality act of 2018, Prop. 3 is the first in a never-ending stream of water bonds to tackle major issues unique to the Central Valley. If passed, Prop. 3 would make available $8.9 billion in general obligation bonds to fund projects for water supply and quality, watershed restoration, fish and wildlife protection, sustainable groundwater management and repair of existing dams and canals. More importantly, the bond would provide $750 million specifically to repair the primary canal conveying water to 15,000 farms and subsidizing supply for several cities along the Valley’s eastside. The Friant-Kern Canal is operated by the Friant Water Authority (FWA) to carry water 152 miles from Friant Dam northeast of Fresno south to Bakersfield. The gravity-fed canal was designed in the 1940s to drop 6 inches every mile and convey water without the use of pumps. At the height of the drought in 2014 and 2015, FWA did not have enough surface water behind the dam to meet the needs of its members, forcing cities, water districts and farms to rely heavily on pumping water out of the ground. Alex Biering, communications director for FWA, said the pumping left a void between the groundwater and the land on top causing the land to sink, a problem known as subsidence. Biering said the problem was most pronounced in the Deer Creek region between Terra Bella and Pixley. At one point, the canal dropped five inches in five months, illustrated by canal water almost lapping up against the bottom of a bridge on Avenue 96. This is a huge obstacle for the gravity-fed canal because FWA must slow the flow of water down the canal to ensure the water doesn’t overflow onto the banks. The more than 3 foot drop in as many years reduced the flow of the canal by an average of 60% from a max capacity of 4,000 cfs (cubic feet per second) to 1,700 cfs, effectively cutting off supply to the lower third of the canal’s water users. Prop. 3 will provide $750 million to fix subsidence issues caused by overpumping during the drought. 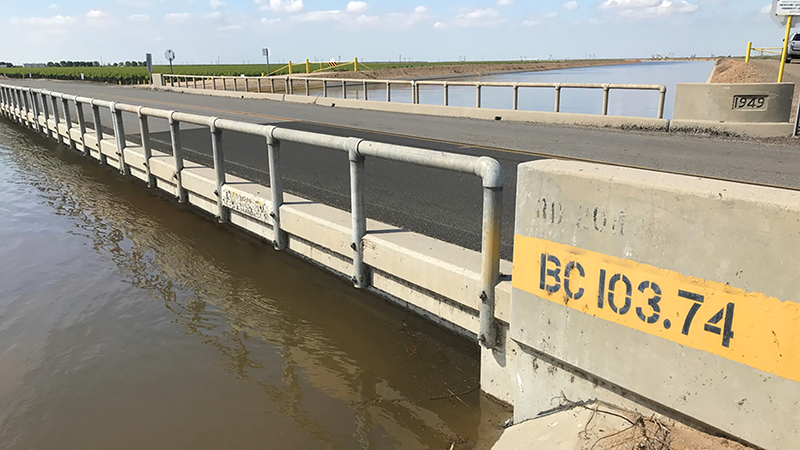 Near the Tulare County, Kern County border, bridges crossing the Friant-Kern Canal have sunk 3 feet in as many years. Submitted photo. The $750 million for disadvantaged communities allocates $250 million for wastewater treatment improvements and $500 million for safe drinking water projects. This is also an issue effecting Valley residents at a much higher rate than the rest of the state. Of the 2800 violations of drinking water standards across the state in 2017, most occurred in the Central Valley and the Central Coast. There were more than 815 violations in Kern County, 413 in Tulare, 328 in Fresno and 282 in Monterey. Tulare County had 124 violations for nitrates alone, more than double the nearest county, Kern County, with 59 violations. These included small water companies in every corner of the county including the Soults Mutual Water Company outside of Tulare, Lemon Cove Water Company, East Orosi Community Service District, and Teapot Dome Water Company near Porterville. The two most prevalent contaminants found in California drinking water are nitrates and arsenic. Nitrite changes the normal form of hemoglobin, which carries oxygen in the blood to the rest of the body, into a form called methemoglobin that cannot carry oxygen. At high enough concentrations nitrate can result in a temporary blood disorder in infants called “blue baby syndrome.” In severe, untreated cases, brain damage and eventually death can result from suffocation due to lack of oxygen, according to the National Institute for Health. Drinking water with high levels of arsenic can cause diabetes, cancer, as well as heart, lung, liver, immune, nervous or reproductive system disorders. The bond has been opposed by the San Diego Union-Tribune and San Francisco Chronicle because it was not crafted by impartial lawmakers or citizen committees. Those statements would be true if Valley lawmakers had an equal seat at the table on which their constituents provide produce. Nearly every non-partisan, local government official that Tulare County has elected to represent them are in favor of the bond because, for the first time in recent memory, there is finally something on the ballot that directly benefits Tulare County rather than something local taxpayers will have to deal with that was decided in Southern California and the Bay Area. The bond has been endorsed by the Dinuba, Exeter, Farmersville, Lindsay, Tulare, Visalia and Woodlake city councils, as well as the Tulare County Board of Supervisors. It has also been endorsed by the Lindmore, Lindsay-Strathmore, Porterville, and Tulare irrigation districts, who are elected by their constituents and are residents of Tulare County. In their resolutions of support for the bond, Exeter, Farmersville, Lindsay, Woodlake, and Dinuba all cited the implementation of the Sustainable Groundwater Management Act as a major financial concern as the deadline draws closer for local Groundwater Sustainability Agencies to submit plans to solve the overdrafted Kaweah Basin. Prop. 3 will provide those cities with $640 million fund to help with that implementation, the first of its kind in the history of the state! The Legislative Analysts Office (LAO) estimates the bonds will increase the state’s annual budget by $430 million for the next 40 years to pay off the principal and interest on the bonds but it is also likely to save local governments in the Central Valley a few hundred million per year over the next few decades for needed water infrastructure improvements. Water districts, cities and counties already spend about $25 billion each year on projects to provide clean drinking water to residents, irrigation water for farmers, and flood protection projects, according to the LAO. Opponents also argue that the subsidence was caused by over pumping from the aquifers by local farmers who then should foot the bill for repairs. Except that farmers aren’t the only ones pumping out of the ground. With the exception of Fresno, Orange Cove and Lindsay, cities in the Central Valley rely exclusively on groundwater to fill bathtubs and flush toilets for 4 million people residing here. Another argument is that only 10% of the bond would go directly toward repairing contaminated water systems in disadvantaged communities. That’s still better than the zero dollars that state lawmakers put toward solving the problem in rural towns such as Lemon Cove, Lindsay, Tooleville, and Orosi when they failed to approve SB 623 last fall and then failed to approve an identical budget trailer bill for the 2018-19 state budget this summer. Prop. 3 is supported by the Community Water Center, a Visalia-based non-profit that has tirelessly fought for the right of rural residents to have access to clean water. Among those who attended the kickoff for the Yes on Prop. 3 campaign on Sept. 20 near Friant Dam were Farmersville Mayor Paul Boyer and Tulare County Senator Andy Vidak. Boyer has spent a career working to help rural communities in Tulare County find funding to repair aging water and sewer systems as a community services specialist with Self-Help Enterprises. Vidak, who co-authored SB 623, recently co-authored similar sister bills SB 844 and 845, to create a statewide fund for clean water projects in rural areas. 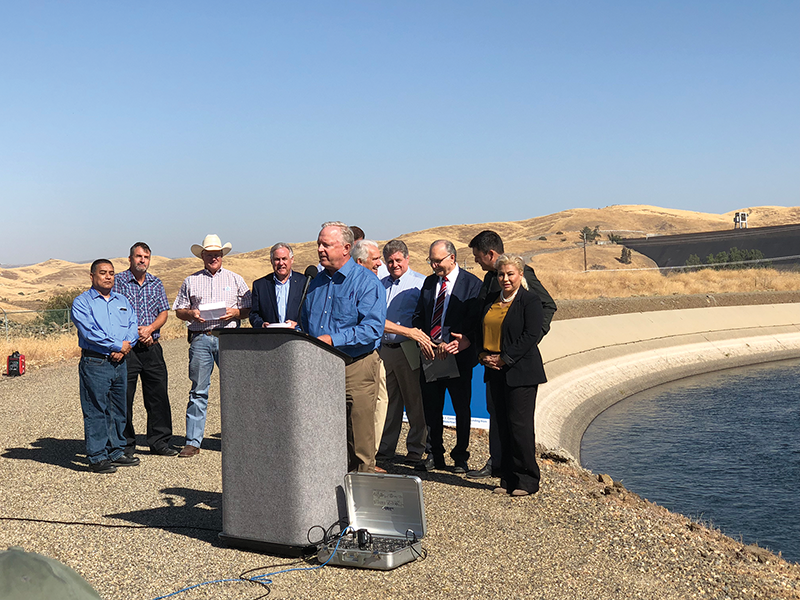 “This isn’t a partisan issue, it’s a human health issue, it’s an environmental issue and it’s a jobs issue,” Vidak told reporters at the event. The Sierra Club condemns the bond because it would have negative environmental effects, yet $2.5 billion (more than a quarter of the bond) would be spent on improving watershed lands such as forests, meadows, wetlands, and areas near rivers. Another $1.4 billion will be set aside for fish and wildlife habitats, including increasing water flows to wetlands and rivers, and buying undeveloped land for preservation. That’s why 119 local, regional, state and national conservation and environmental justice organizations have endorsed the measure. The opposition also points out that Californians seemingly approve a water bond every year. Since 2000, California voters have approved about $31 billion in water bonds. Of this amount, roughly one-third was still available to pay for new projects as of June 2018. Proposition 68 was just passed in June but woefully underfunded the need for water infrastructure with just $1.5 billion marked for water. Proposition 1, the last water supply and water quality bond, was passed in 2014 and provided $7.5 billion in funding. The League of California Cities estimates that nearly all of that bond will be allocated by the end of the current fiscal year. There are some points of Prop. 3 on which even its opponents to the north and south can agree. It will provide $200 million for Sierra Nevada watershed restoration, $20 million for San Joaquin River Conservancy, $60 million for habitat and natural community conservation plans, $210 million for waterfowl and fish habitat restoration, $100 million for San Joaquin River fisheries, $100 million on screens to prevent fish from being drawn into intake pipes, and $50 million for post-fire watershed restoration. That’s why agencies supporting the proposition also include Kaweah Delta Water Conservation District, Sequoia Riverlands Trust, San Joaquin Valley Water Infrastructure Authority, and the South Valley Water Association. And despite its sister newspaper’s condemnation of the bond, the Fresno Bee supports Prop. 3. Valley leaders are all but unanimous in their support of Prop. 3, a telling sign that the latest water bond will be the first to put the Valley first.